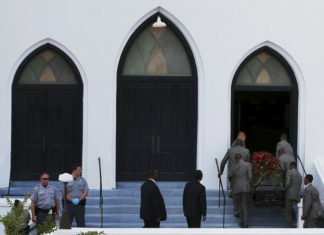 The use of lethal force by police officers in Ferguson and Staten Island has raised many concerns about the dynamic between police and citizens and underlined the fact that all time favorite fictional policeman, Sheriff Andy Taylor of the Andy Griffith TV show, is very much an out-of-date representation of what law enforcement is in the 21st century. Today’s ideal is “democratic policing.” This means, broadly, a police force that is publicly accountable, subject to the rule of law, respectful of human dignity and that intrudes into citizens’ lives only under certain limited circumstances. In order to reach that ideal, policing in America has evolved considerably over the past fifty years – from who becomes an officer to how relations with civilians are managed and what technologies are used. Demographically, the 20th century has seen a slow but steady integration of minorities and women within police forces. Different managerial models aimed at improving relations with citizens have also influenced policing over the last forty years. The most prominent among these are community-oriented policing (COP), problem-oriented policing (POP), and intelligence-led policing (ILP). Finally, policing strategies and operations have been deeply transformed by the rapid integration of new technologies leading to computerization of police forces, access to a broader range of weapons and the deployment of surveillance technologies. 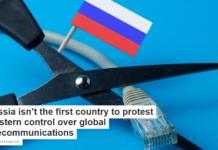 These changes were initiated in the 20th century. Their outcomes are what we are now witnessing: both positive and negative. Policing in America is not a standardized profession guided by an established set procedures and policies. There are at least 18,000 local, state, and federal police agencies in the United States. The US police system is one of the most decentralized in the world. Police chiefs and commanders represent a critical source of influence. They provide the doctrine (prevention or repression of crime), design strategies (police visibility or zero tolerance), and identify the practice to be adopted (rounding up the usual suspects or systematic stop and frisk). Often these police practices are not aligned with public expectations. Citizen review boards – such as those in New York City or San Diego – are the exception rather than the norm. And then there is the money issue. Police departments that are financially crippled will simply not be able to provide regular training; they will not have the expertise then to pursue certain kinds of crime. The policing of fraud, for example, requires financial expertise and specialized units. Police work in an affluent neighborhoods is often characterized by soft policing strategies. In other words, policing in those areas is more a question of making people feel secure or public relations than actual crime fighting. 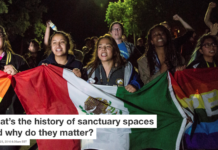 However, in disadvantaged neighborhoods, police presence and activity are often more intense. They are there to target crimes that have been identified as priorities by police leadership and public officials. In high crime areas, intensive policing can translate into several strategies and tactics. A noticeable trend that is front and center in the media today is the “militarization” of police. This blurring of the distinction between the police and military institutions, between law enforcement and war began in the 1980’s and has only intensified since. It was reinforced by public policy rhetoric calling for a “war on crime,” “war on drug,” and “war on terror.” Police forces began to acquire military equipment and implement militarized training but with little or no accountability. For instance, in the wake of September 11, 2001, several local police departments received funding from the Department of Homeland Security and Department of Defense with little or no guidance on how to spend the money leading to unnecessary purchase of military equipment including armored cars, bullet proof vests for dogs, and advanced bomb-disarming robots. 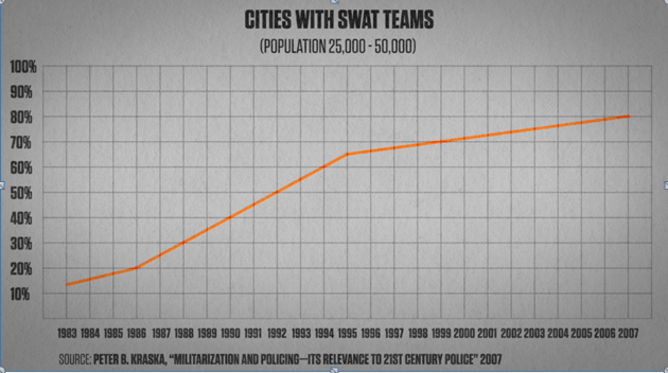 As a result we have seen a booming of SWAT (Special Weapons and Tactics) teams: 80% of cities with 25,000 to 50,000 inhabitant now have a SWAT team (see graph below.) From the late 1990s, through the 1033 program, the Department of Defense has authorized the transfer of military equipment to police departments across the country. Since 2006 the police have bought 93,763 machine guns and 435 armored from the Pentagon. All this has only heightened the real and perceived potential for deadly force by police officers. Police agencies now have access to a vast network of Closed-Circuit Television (CCTV) monitors, allowing the surveillance of public and private spaces. Just to give a few numbers, the Chicago PD has access to 17,000 cameras including 4,000 in public schools and 1,000 at O’Hare Airport. Drones, too, are increasingly in use. The US Border Patrol deploys them to monitor smuggling activities. They have been purchased by a number of local police departments including those of Los Angeles, Mesa County (AR), Montgomery County (TX) Miami Dade and Seattle. In addition, some law enforcement agencies such as the Virginia State Police allow members of the public to send text and video files of suspicious activity taken from their smartphones. This combined with the ability to process large amounts of data through specialized software has meant that some police agencies – such as that of Shreveport – are now capable of predicting the occurrence of crime in time and space. We may still be far from a “Minority Report” scenario but we have clearly entered into a surveillance society in which risk and harm reduction directly challenge civil rights. This trend has already created problems in the counter-terrorism arena with the creation of erroneous suspect lists and intensive monitoring of Muslim communities . 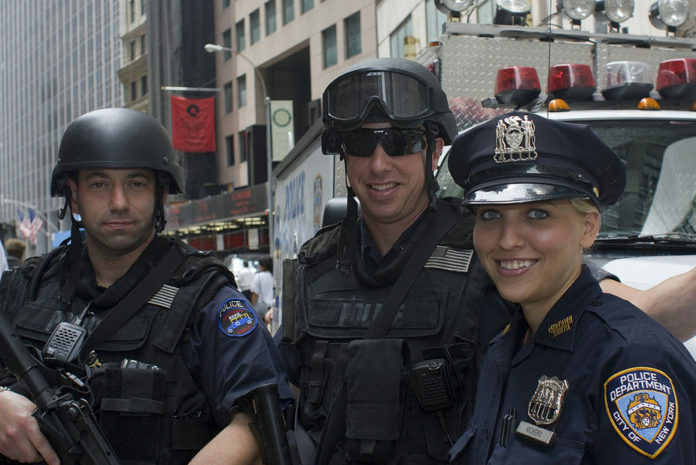 When applying this assumption to the phenomenon of intensive policing, it is not surprising, I would argue, to witness the militarization of the police in a nation that has the highest rate of gun ownership among Western countries, the highest murder rate by guns among advanced democracies, and the largest military apparatus of the world. Similarly, encounters between police and citizens take place in the larger social framework of racial, class, and gender expectations. Racism, sexism, and bigotry exist within professional subcultures (such as that of the police) but also across society at large. Ultimately, policing is inseparable from politics. Police organizations are constantly influenced by political pressure such as the nomination of a new chief of police or new laws that police will have to enforce. The state of our police system, in other words, for good or for ill is an accurate proxy measure of the state of our democracy.